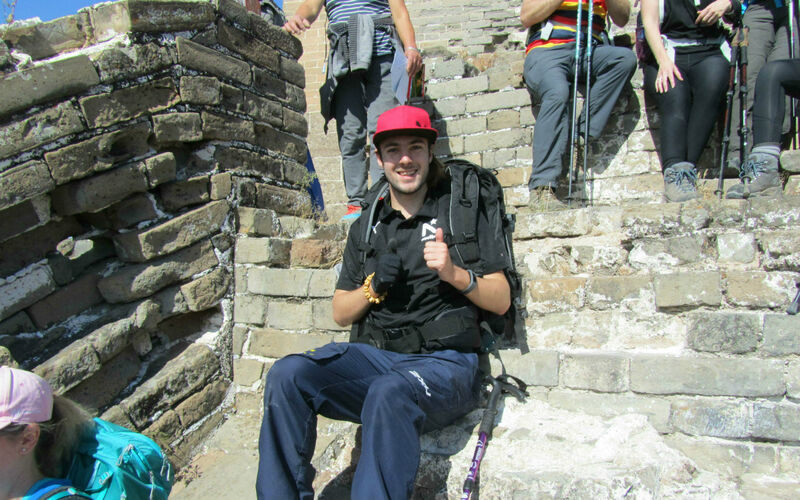 Well the adventure of a lifetime trekking along the Great Wall of China has finally arrived. 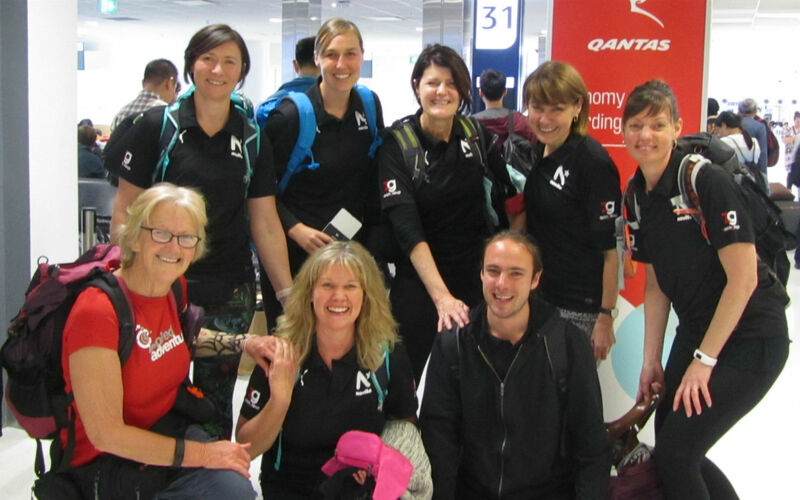 With all but one of the Novita Team flying in from Adelaide to connect with our flight to Beijing, with participants being both excited and nervous. Jarred is flying in to join us tomorrow. After a couple of cheeky champagnes at the airport, followed be the obligatory team photo at the boarding gate we settled in for our 11 and half hour flight to Beijing. With the plane circling the airport in Beijing for sometime before landing it was a huge relief to get off the plane and onto the bus for our 40 minute transfer to our hotel. Arriving at our hotel we found we’d been changed to the 5 star Kingwing Hot Spring International Hotel, very swish…. A relaxed start for us all today as we are not meeting Tony, our local guide until 10am. So for some it was a sleep in but for the others the urge to get out and about and start some early exploring couldn’t be resisted. The weather is surprisingly warm and after a short walk we found China’s equivalent to our Woolworths supermarket, the Yansha Shopping centre. Pallets of pork and beef ready to be literally chopped up on a table for shoppers to choose the pieces to purchase. It seemed more like a market place than a supermarket. Natalie loved all the spices, preserves, meat and gross stuff and Karina managed to find the moon cakes and lollies. Then it was time to visit Jingshan Park, with its many steps to the Pagoda at the the top it was just a little taste of what is to come over the next couple of days. The view from the pagoda overlooks the Forbidden City. Natalie became the first person to succumb to the souvenir sales with the purchase of a cute little Panda. Lunch was a short walk from the city’s Bell Tower and our first introduction to the authentic local cuisine which everybody absolutely loved, it was hard to pick a favourite dish. Tiananmen Square, Imperial Palace and the Forbidden City were on the agenda for this afternoon and they didn’t disappoint. First constructed in 1406, it is the largest and best preserved set of imperial palaces and ancient wooden buildings in the world. Home for both the Ming and Quing Dynasties. Just magnificent! Another yummy Chinese feast tonight and the local beers only $3 for 600ml, bargain! Tomorrow the Great Wall trek begins. There is excitement all around as we settle onto the bus and make our way to the Eastern Qing Tombs. The scenery soon changes from the massive skyscrapers and hustle and bustle of the city to smaller villages with roadside stalls selling all manner of things. There was always something fascinating to look at. The Tombs, according to Feng shui theory, are in an ideal location for the mausoleum. With the mountains on all sides and rivers flowing out of the natural exit, the emperors believed that they would rule forever in the afterlife. There are over 15 tombs in the complex which is one of the largest and best preserved in China, with over 161 royal family members buried in the tombs, including Dragon Lady, Empress Dowager Cixi. Over 4500 tasks of gold where used in her tomb. After lunch it was back on the bus for about an hours drive to start our trek on the wall. The scenery now farmlands and orchards, mainly corn, apples, peaches & hawthorn. With the very first sight of the wall you could feel the excitement on the bus. 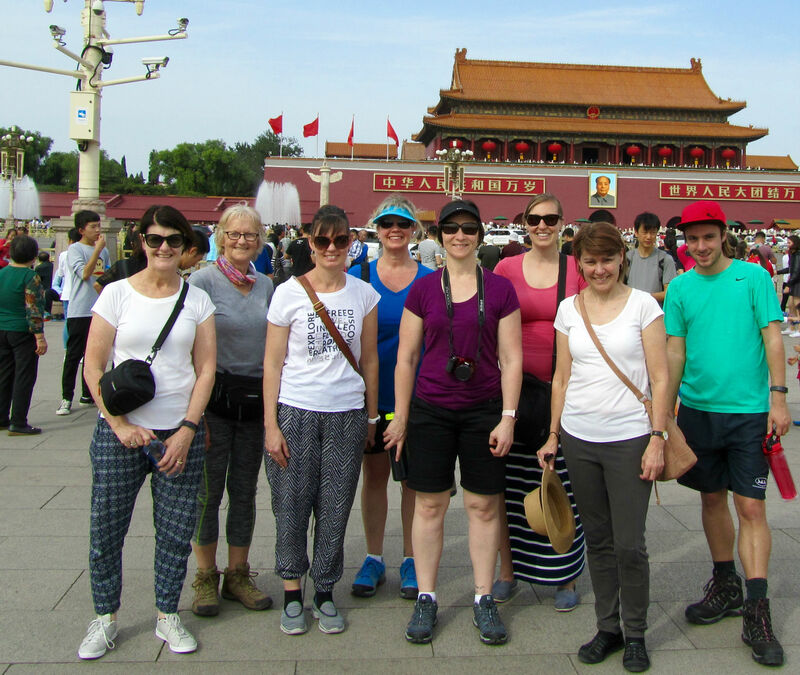 We started at Taipingzhai Gate, then up lots and lots of steps, then down lots and lots of steps. This section that we walked today was entirely restored. Smiles all round from everyone who all felt so privileged to be there. This morning Team Novita woke up to see the Great Wall towering above our hotel. Karina chose to go for a run, a couple went for a walk and some had a little sleep in. Today we are going to trek one of the most invasion prone sections of the wall and also a part of the most unrestored section. What was meant to be a 2 hour bus ride turned into a 3 hour journey due to China’s conjested traffic and also the police inspection stations when crossing provinces. On the way the bus had to make a toilet stop at a roadside toilet house. I’m not sure who got the best deal: the guys who went bush, the couple of the ladies decided to also go bush or the people on the bus watching the faces and reactions of the women who decided to brace the toilets. The trek today was hard, up lots of stairs and uneven ground, but the stamina and never give up attitude of this group is amazing. The wall seems to goes off in all directions and each new section bought more photo opportunities. Once we made it to the top of this section we took a couple of minutes to reflect on why we are here and our journey to get here. For some of us that was pretty emotional. 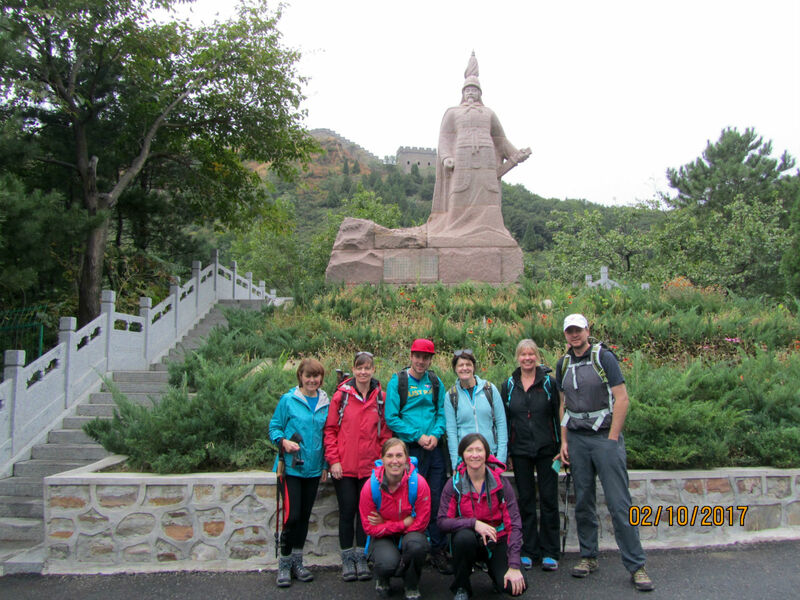 Only a 30 minute drive to start our trek this morning, this section of the Wall is 130 kms north west of Beijing. 1500 steps….did I say 1500….yes 1500 steps from the East Gate entrance to the first tower and the start of our Jinshanling trek. We were rewarded with some of the most amazing views, everywhere you looked the Wall spread out on top of the mountains. A total of 31 watchtowers in the section. The Great Wall at Jinshanling is half restored and half natural with many original features. Poems and inscriptions are carved into many of the blocks that make up the wall. There were still more steps, very steep sections but the views were so worth it. Lots of oohs and ahs and big smiles all round.Then it was time to descend, not sure which is hardest on the body, going up or down. Lunch today was at a little village restaurant managed by local farmers, great selection of food again along with moon cakes which is a traditional food eaten on National Day for People’s Republic of China which is a day for family celebrations. “Nothing can prepare you for the beauty of China. We’ve been trekking on the Wall for three days now and the views are astounding from start to finish. It’s not just the Wall either, it’s the way the wall snakes through beautiful and rugged mountain ranges. Just stunning. The Chinese people are so welcoming, the perfect hosts. Today we hiked the Mutianyu section of the Great Wall, the best persevered and I was going to say most beautiful section but it’s all stunning. The Wall here served as the northern barrier defending the capital and the Imperial Tombs. Only a half hour bus ride from our hotel, on arrival at the wall we collected our takeaway subways for lunch. 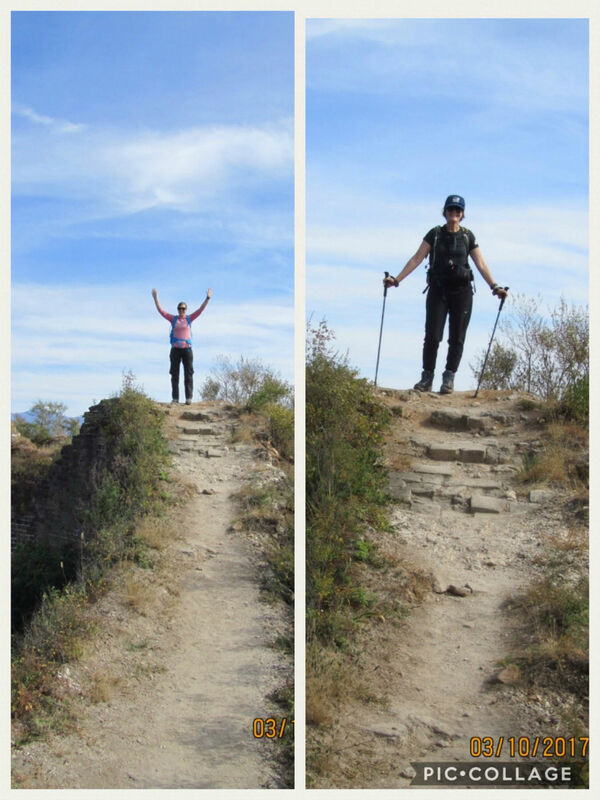 The first challenge of the day for a couple was overcoming the fear of the chairlift or walking the 4000 steps to the top…..they both managed to brave the chair lift but missed the magnificent views because they had their eyes closed the entire ride. Once on the Wall, there were steps, steps and more steps……big steps, narrow steps, steep steps, every size you could imagine even a glass step section. The surrounding natural scenery of mountains and the beautiful Autumn colours was breathtaking and the views from the top so worth the effort getting there. 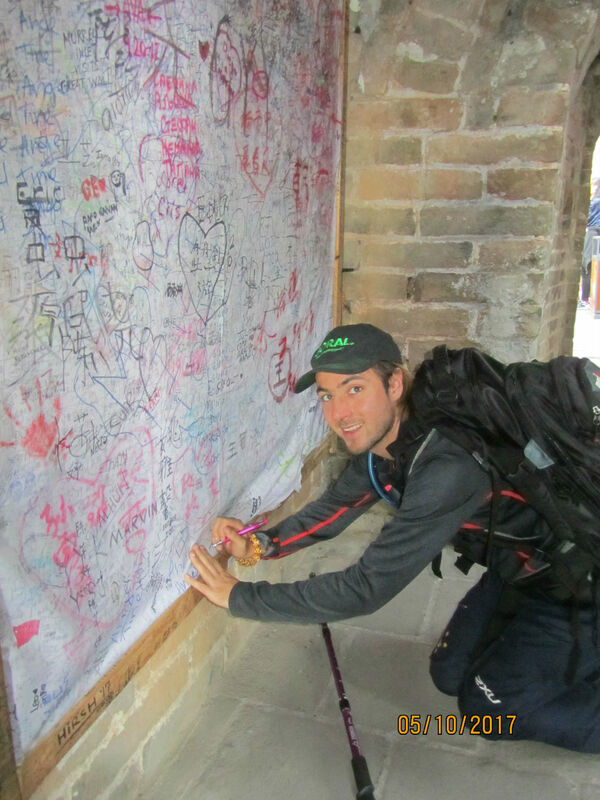 Karina and Natalie decided to challenge themselves a little more and trekked further along the Jiankou section of the wall until the reached the sign saying they had reached the highest point of the Great Wall. The police guards on duty let them pass from Mutianyu section to Jiankou without having tickets but it took some funny talking between English and Chinese before they were allowed to cross back. (Certainly a funny story they will both remember for years to come). The return trip down the mountain was a fun toboggan ride, although we couldn’t release any speed demons because of the huge number of people on the ride. At the bottom a cheeky beer for some and of course the obligatory souvenir shop for others. Another awesome day on the Wall. When asked which day they liked the best, most responded with all of it, each day was so different it was all special. My personal favourite is the Gubeikou section because of its raw beauty. After breakfast it was on the bus for our transfer back to Beijing, a little sad but a lot are relieved that our trekking is over, not sure if we could manage another day of steep steps. On arrival in Beijing first stop was the 798 Art District for our first real coffee in a week. 798 is a complex of former State owned factories used for manufacturing weapons and electronics, now a funky district full of art, coffee shops, cafes and boutique shops. 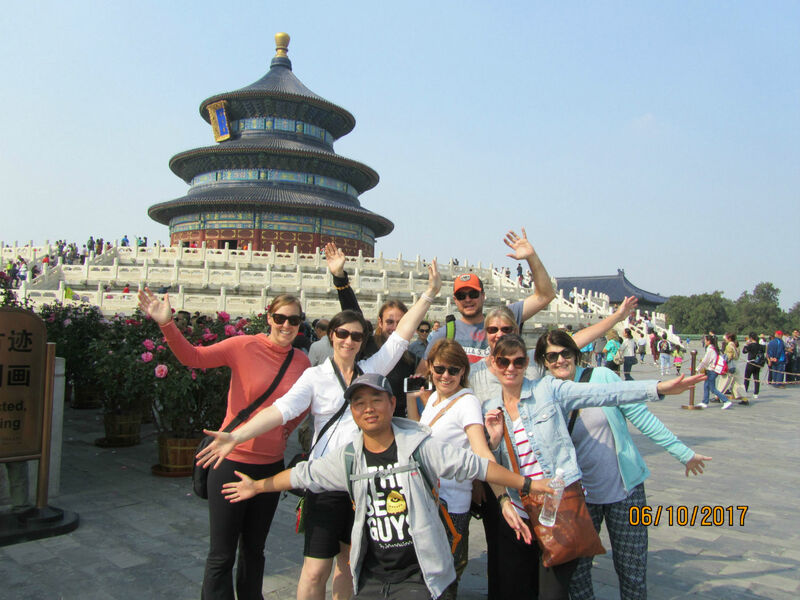 After some time wandering around and a few knick-knacky purchases by some it was onto the Temple of Heaven. 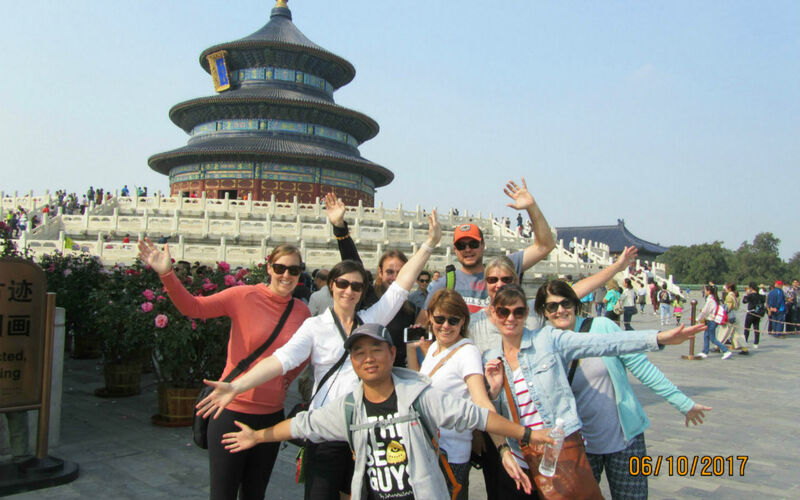 The Temple of Heaven is the largest temple complex in China and was built in 1420 and heritage listed in 1998. During both the Ming and Qing dynasties the emperors would pray to the heavens for good harvests. In the grounds of the temple we were lucky enough to have our very own Tai Chi Master for an hour teaching us some Kung Fu defence moves. Then onto a traditional Chinese tea ceremony. We tried several different teas and learnt that the first cup (small) should be drank in 3 sips…for health, happiness & longevity. I’m exhausted already but not finished for the day yet. We were all then dropped off at the Pearl Markets for just over an hour, what a lot of fun everyone had spending their money on “genuine” fakes….’leather’ bags, nikes, sports clothes….you name it you could buy it. And finally, our last team dinner together at a special restaurant in Beijing specialising in traditional Peking Duck. What a privilege it has been trekking with this awesome group of people, nothing was ever too hard and they had each other’s back the whole time. Congratulations Team Novita, you’ve conquered the Wall and many of you have conquered personal fears and raised over $47,000 for Novita……job well done!!!! I’m sure tomorrow will be a little more relaxed before our very late departure from Beijing tomorrow night. Today is our last day in China and a free day to enjoy this magnificent city. After a sleep in for some, breakfast and then it was time to explore Beijing. 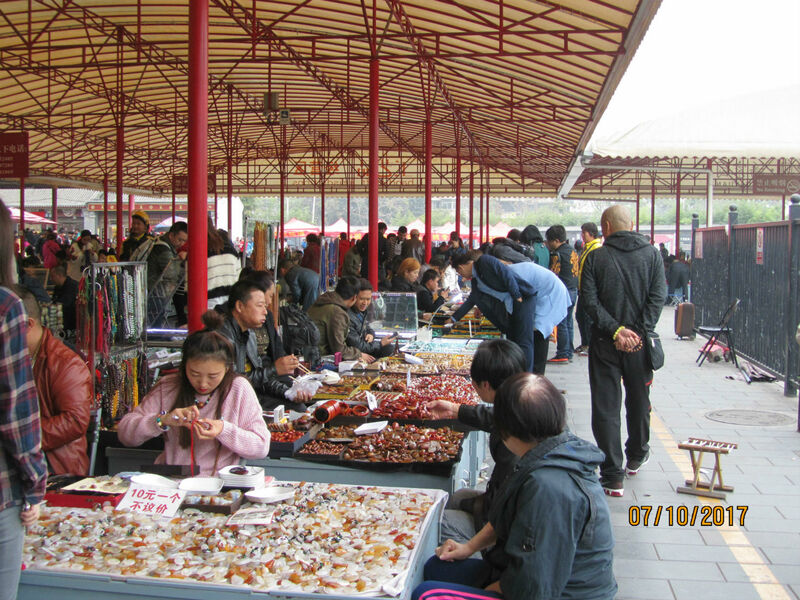 Many chose to visit the local flea market, some walked the 7 or 8 kms back to the ‘genuine’ fake markets to buy those last minutes gifts for family members back home. Cathryn, Jen and Sue who are staying on in Beijing for a couple of days checked into their new luxury accommodation. Karina and Natalie even managed to get a manicure. After checking out of our hotel at 2pm we all met up at 4pm for our final get together as a group. Local beers, 600ml for 5 yuan (not quite $1) tasted pretty good. Some chose to order food, and did an amazing job, considering they were ordering without our local guide and also had to order gluten free. We were met back at our hotel by local guide Ming for our transfer to the airport. Lots of farewell cuddles for everyone and finally on the bus to say goodbye to China. Our flight left at 00.35 am on the 8th October arriving back in Sydney about 3ish Sunday afternoon, a long flight but time to catch up on some sleep. Some last minute duty free shopping at Sydney international airport before transferring over to domestic for our flights to Adelaide. An awesome trek and some incredible memories and friendships made.